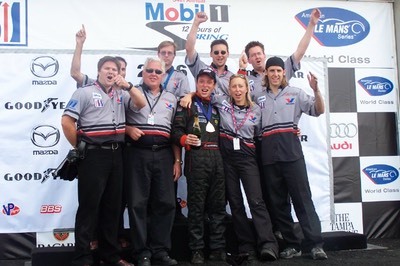 The season closing two races of the 2008 American LeMans Series season have come to pass. These final two races are a story of massive anticipation, heart wrenching adversity, and spirited closure on a strong season of racing for BP, Mazda, B-K Motorsports, and our fans. 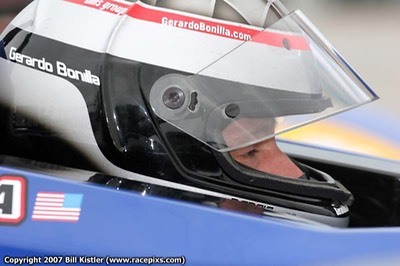 We arrived at Road Atlanta a week before the October 4 race for two days of testing. 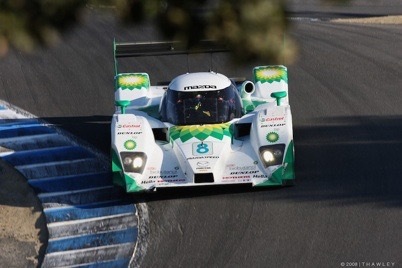 We had our brand new BP Lola B08/86 Mazda MZR-R closed cockpit coupe, bringing back warm memories of the IMSA GTP days, and fulfilling a lifelong dream of racing in prototype sports cars with the fighter-jet style canopy in place. The following week, as official practice progressed, we enjoyed a steady improvement in the car's performance. Our engineer Mike Wright kept finding more setup options for Ben and I to use. Ben did a fine job in qualifying on Friday. We slept well that night. On Saturday morning, I was given the Warmup session duty. Manager of Motorsports Development for Mazda, John Doonan, asked me before the warmup to be smart and remember we had a long race ahead. I nodded approvingly. The track was really cold that morning, and getting the tires up to temperature was one of the hardest tasks I had all week. But, the temps came up fine, and the car began to fly. I was on course truly enjoying the moment. Remember what they say about getting too comfortable on the ski slopes? On what would have likely been my final practice lap, I entered Turn 1 at around the usual 150 mph, completely comfortable with the car, but bounced over the apex curb. I had hit this curb plenty of times before and it was never a problem. This time, the car snapped around, and I was instantly off course, backwards, and in the grass at 130 mph. I hit the wall so hard, the wall moved a few inches. The car was really bad. My heart was crushed. Devastated. How could I have let this team down? How could I have denied Mazda, BP, every member of this crew, and all our fans the sight of our car in the Petit LeMans race? Could some outside problem have caused the crash? Maybe. But, its my responsibility to keep things safe. It was a horrible setback, we would miss the race, but our team got set straight away on planning for Mazda Raceway at Laguna Seca in two week's time. The car was completed just in time to attend the season finale. 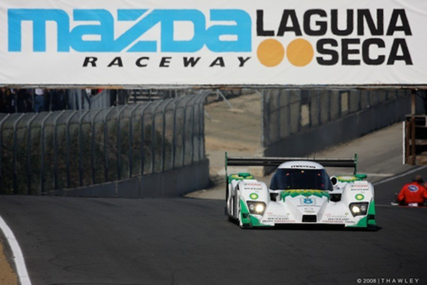 Mazda Raceway at Laguna Seca is located in beautiful Monterey, California. As this is Mazda's home track, we were glad to be joined by many guests from the home office for the October 18 race. Our practice sessions were only interrupted by a few red flags when others went off into the gravel traps. In the Saturday race Ben did a fine job in his opening stint, improving three positions in just the first two laps. He stayed in the car for just over two hours of the four-hour race. Alas, the racing gods didn't allow us a totally trouble-free run. As Ben's final stint was progressing, he came in with an exhaust leak. It would take 45 minutes for the crew to fix the leak. It was magical to watch them work, and fantastic to hear the fans applaud them as the car fired up and left the garage. I drove the final hour of the race, and although many laps down, we enjoyed the run into the night sky. It was quite special to take the final checker flag of the season, especially driving the thrilling Turns 9 and 10 while in the corner of my eye seeing fireworks exploding gloriously over the front straightaway. My heartfelt thanks to Robert Bach of B-K Motorsports, John Doonan and Robert Davis of Mazda for allowing me to continue my relationship with Mazda by racing for this professional team. Thanks to every member of our B-K Motorsports crew, current and past, who have shaped us into what we are today. Special thanks to our partners at BP, Castrol, Mazda, AER, Dunlop, Mothers, Skip Barber, and many others who participate in the Mazda family. 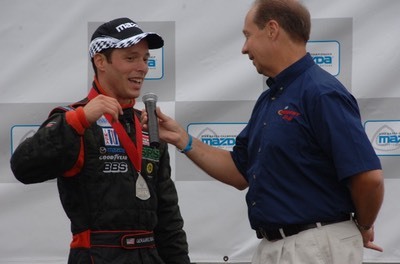 Thanks to Dan Andersen for your continued support of my career, and congratulations to you for your team championships in F2000 and Star Mazda, and race wins in Indy Lights this year. Many thanks to the investors who have been with me the last eight years. I could never have arrived in the ALMS without your support. 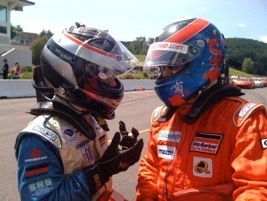 Thanks to the instructors of Skip Barber Racing School, who have taught me so very much. Sincerest thanks to my family and closest friends. You have stood by me through good and bad. You've been there when I needed you. Race driving is one of the most amazing, yet most difficult jobs out there. It could not be done without your love and support. Thank you. And thanks to all of YOU. Thanks for helping, supporting, cheering, writing, or just being there with me. I hope to see you all at a track again soon. 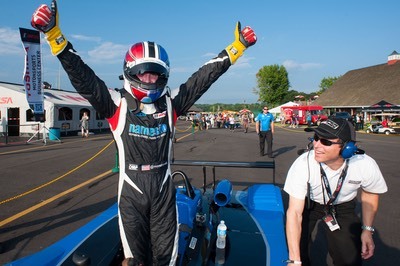 Link to SPEED Channel's Marshall Pruett 16-minute video feature as aired on www.speedtv.com. 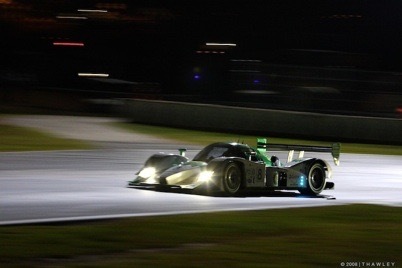 "Inside the new Mazda Lola LMP2 Coupe"